Rob Winner – rwinner@shawmedia.com Tommy Padilla, 2 of Malta, stands on the bumper of a fire engine and smiles for his grandmother Anne Roussell (not pictured) before a dedication ceremony honoring Timothy Getzelman and Alexi Weber at the Sycamore Fire Department Fire Station No. 2 Sunday afternoon. 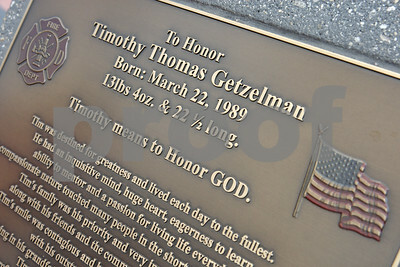 Rob Winner – rwinner@shawmedia.com A plaque honoring Timothy Getzelman is seen near a flagpole outside Sycamore Fire Department Fire Station No. 2 Sunday afternoon. Rob Winner – rwinner@shawmedia.com Kamron Kroeger (right) presents Tamara Getzelman with a quilt made by her family during a ceremony honoring Timothy Getzelman and Alexi Weber at the Sycamore Fire Department Fire Station No. 2 Sunday afternoon. Rob Winner – rwinner@shawmedia.com Tamara Getzelman smiles while listening to Justin Stafford (not pictured) as he describes Timothy Getzelman during a dedication ceremony honoring Timothy Getzelman and Alexi Weber at the Sycamore Fire Department Fire Station No. 2 Sunday afternoon. The couple were killed in a car crash last year. 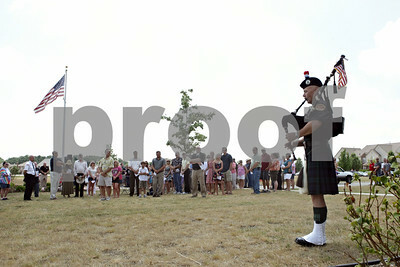 Rob Winner – rwinner@shawmedia.com Bagpiper Tom Murphy of the DeKalb Fire Department and the Highland Honor Guard plays "Amazing Grace" during a dedication ceremony honoring Timothy Getzelman and Alexi Weber at the Sycamore Fire Department Fire Station No. 2 Sunday afternoon. The couple were killed in a car crash last year. Rob Winner – rwinner@shawmedia.com Matthew Clark of The House Cafe sorts a box of unused notebooks and binders during the fourth annual Music Show: Collecting School Supplies at The House Cafe in DeKalb Sunday afternoon. 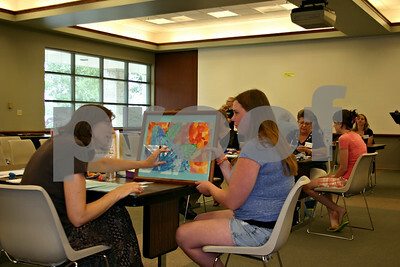 Guests to the event brought school supplies to benefit the Salvation Army in DeKalb. 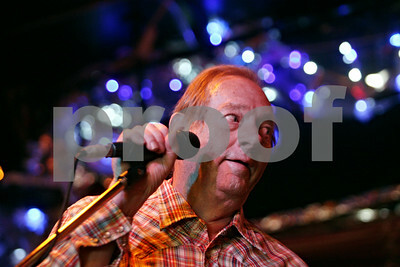 Rob Winner – rwinner@shawmedia.com Gary Mullis performs on stage during the fourth annual Music Show: Collecting School Supplies at The House Cafe in DeKalb Sunday afternoon. Guests to the event brought school supplies to benefit the Salvation Army in DeKalb. 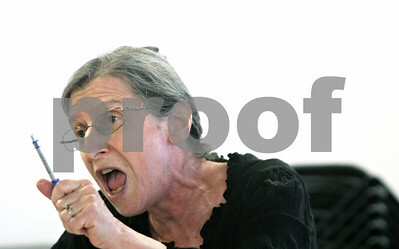 Rob Winner – rwinner@shawmedia.com Irene Rubin voices her concerns to Illinois State Treasurer Dan Rutherford during a roundtable discussion at the DeKalb County Community Outreach building Tuesday afternoon. 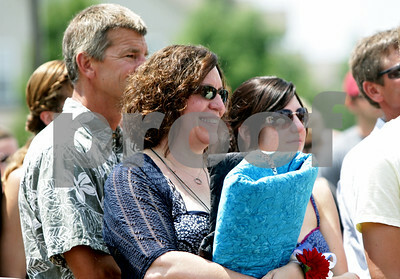 Tuesday, July 17, 2012 DeKalb, Ill. 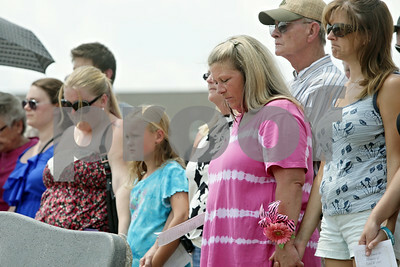 Rob Winner – rwinner@shawmedia.com Dawn Weber (second from right), mother of Alexis Weber, holds hands with family during a ceremony honoring Timothy Getzelman and Alexis Weber at the Sycamore Fire Department Fire Station No. 2 Sunday afternoon. 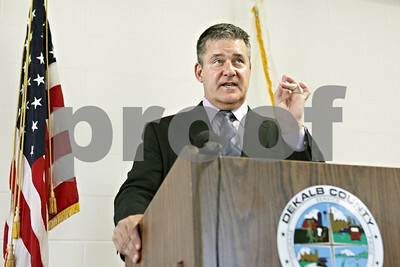 Rob Winner – rwinner@shawmedia.com Illinois State Treasurer Dan Rutherford addresses the state's fiscal and policy issues during a roundtable discussion at the DeKalb County Community Outreach building Tuesday afternoon. 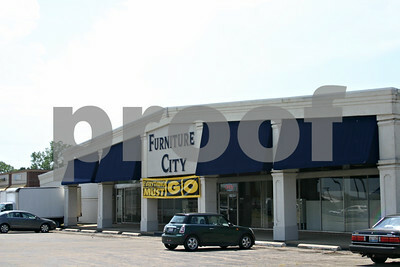 Tuesday, July 17, 2012 DeKalb, Ill. Rob Winner – rwinner@shawmedia.com Barbara Wojnicki (left) of Campton Hills speaks with Illinois State Treasurer Dan Rutherford before a roundtable discussion at the DeKalb County Community Outreach building Tuesday afternoon. 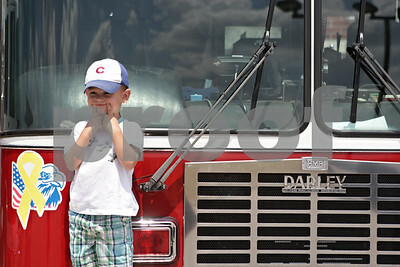 Tuesday, July 17, 2012 DeKalb, Ill. 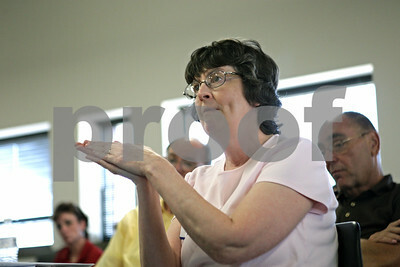 Rob Winner – rwinner@shawmedia.com Debbie Kern of DeKalb voices her concerns to Illinois State Treasurer Dan Rutherford during a roundtable discussion at the DeKalb County Community Outreach building Tuesday afternoon. Tuesday, July 17, 2012 DeKalb, Ill.
Kyle Bursaw – kbursaw@shawmedia.com Volunteers Judy Lawrence (from left), Jane Bastian and Rebeka Appel stuff trauma dolls, as June Tritt (far right) checks the quality of the stuffed dolls before they are sewed shut at Oak Crest in DeKalb, Ill. on Wednesday, July 11, 2012. 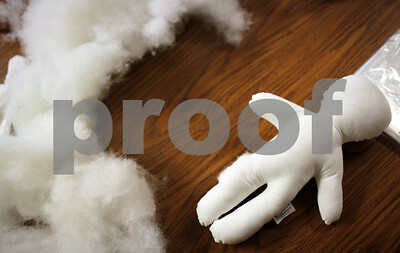 Kyle Bursaw – kbursaw@shawmedia.com A stuffed trauma doll sits on a table near some cotton at Oak Crest in DeKalb, where volunteers meet weekly to make the dolls for Kishwaukee Hospital, where they are used to explain medical procedures to children. Rob Winner – rwinner@shawmedia.com Genoa Police Sgt. 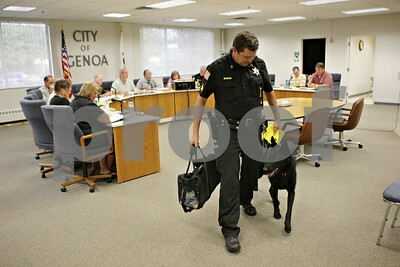 Robert Smith and Kane, Genoa's new police dog, finish up their demonstration for city council members Tuesday evening. The purchase of the K-9 and its training was paid for by donations and fundraisers. 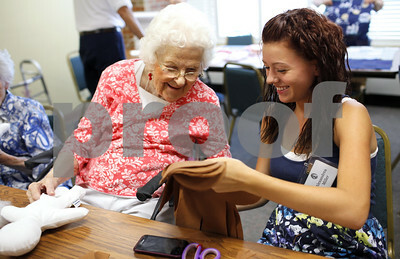 Kyle Bursaw – kbursaw@shawmedia.com Oak Crest resident Mary Carpenter and Alexandrea Miller, 16, chat while making trauma dolls at Oak Crest in DeKalb on Wednesday, July 11, 2012. Volunteers meet weekly to make the dolls for Kishwaukee Hospital, where they are used to explain medical procedures to children. Rob Winner – rwinner@shawmedia.com Kane is Genoa's new police dog as seen on Tuesday evening. The purchase of the K-9 and its training was paid for by donations and fundraisers. Rob Winner – rwinner@shawmedia.com With the guidance of Genoa Police Sgt. 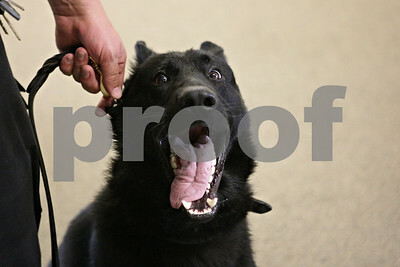 Robert Smith, Kane, Genoa's new police dog, demonstrates his ability to track down drugs Tuesday evening at the police station. The purchase of the K-9 and its training was paid for by donations from the community and fundraisers. 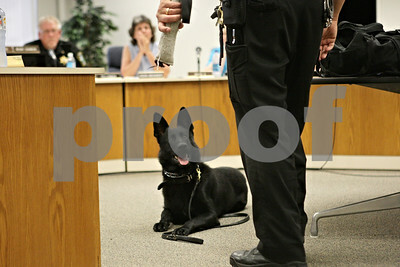 Rob Winner – rwinner@shawmedia.com Kane, Genoa's new police dog, sits quietly as his handler Sgt. Robert Smith talks to city council members Tuesday evening before a demonstration. The purchase of the K-9 and its training was paid for by donations from the community and fundraisers. 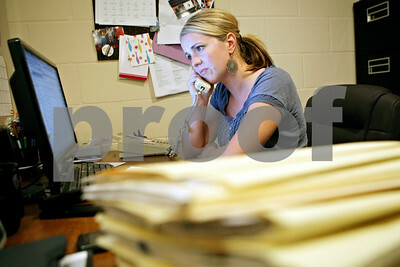 Rob Winner – rwinner@shawmedia.com DeKalb Police Sgt. 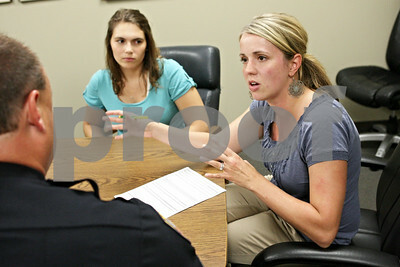 Jason Leverton (left) speaks with DeKalb County Youth Service Bureau clinical director Ahna Young (right) and intern Michelle McCabe Thursday afternoon at the DeKalb Police Department. DCYSB, which works with youths and their families, is still owed money from the state from fiscal year 2012. 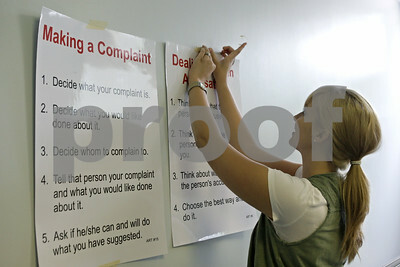 Rob Winner – rwinner@shawmedia.com DeKalb County Youth Service Bureau therapist Erica Garceau hangs up posters for a Managing Emotions, Thoughts, & Actions, or META, group counseling session at the DCYSB offices Thursday afternoon in DeKalb. DCYSB, which works with youths and their families, is still owed money from the state from fiscal year 2012. 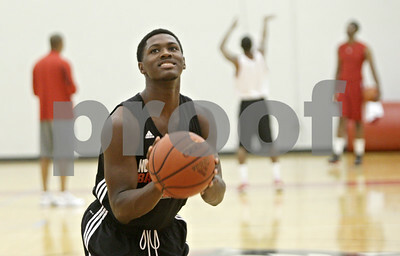 Rob Winner – rwinner@shawmedia.com Northern Illinois freshman Akeem Springs practices his free throw shot during a practice Tuesday in DeKalb. 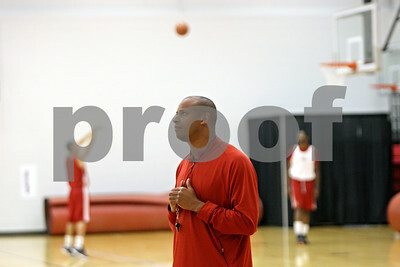 Rob Winner – rwinner@shawmedia.com Northern Illinois basketball coach Mark Montgomery watches his players shoot free throws during a practice Tuesday in DeKalb. 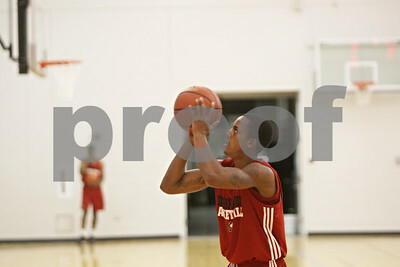 Rob Winner – rwinner@shawmedia.com Northern Illinois freshman Daveon Balls practices his shot during a practice Tuesday in DeKalb. 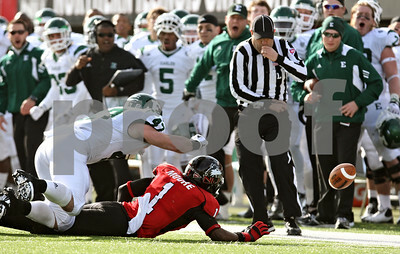 Rob Winner – rwinner@shawmedia.com A referee watches as a pass intended for Northern Illinois receiver Martel Moore falls incomplete during a game against Eastern Michigan on Friday, Nov. 25, 2011, in DeKalb. 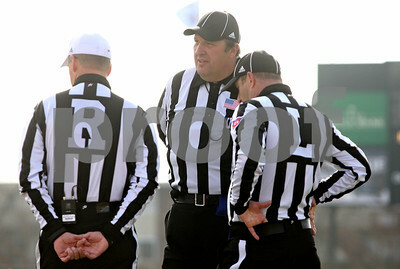 Rob Winner – rwinner@shawmedia.com Three referees meet during a Northern Illinois football game on Friday, Nov. 25, 2011, in DeKalb. Rob Winner – rwinner@shawmedia.com Clinical director Ahna Young uses a telephone to speak with a fellow therapist about an active case within her office at the DeKalb County Youth Service Bureau Thursday afternoon. DCYSB, which works with youths and their families, is still owed money from the state from fiscal year 2012. 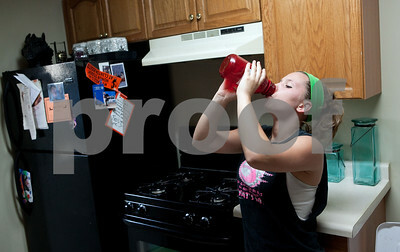 Kyle Bursaw ‚Äì kbursaw@shawmedia.com Danika Thibault downs a mixture of Muscle Milk and water in her father's kitchen on Wednesday, June 20, 2012. The shake is a high-protein addition to her regular diet. Kyle Bursaw ‚Äì kbursaw@shawmedia.com Danika Thibault does core work on an incline at United Mixed Martial Arts & Fitness on Monday, June 4, 2012. Thibault normally works with the class in the background but trained solo with some guidance from her father Sean Thibault (not pictured) because she had an injured wrist and ankle. Kyle Bursaw ‚Äì kbursaw@shawmedia.com Danika Thibault works on her moves at United Mixed Martial Arts & Fitness on Monday, June 4, 2012. Thibault normally spars with others in class there, but worked solo because she had some injuries to her wrist an ankle that day. Kyle Bursaw ‚Äì kbursaw@shawmedia.com Danika's father Sean Thibault fastens her headgear before her first sparring match in over a month, against 20-year-old Nate Beach. Kyle Bursaw ‚Äì kbursaw@shawmedia.com Danika uses a mask that reduces oxygen intake to simulate a higher elevation while training at United Mixed Martial Arts & Fitness on Thursday, June 7, 2012. 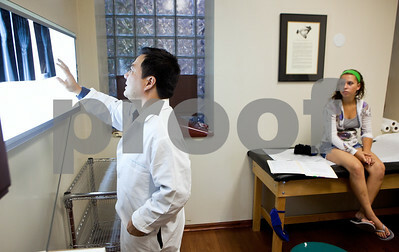 Kyle Bursaw ‚Äì kbursaw@shawmedia.com Dr. Allen Van, of Van Orthopaedics, looks at an X-Ray of Danika Thibault's wrist in one of his exam rooms in DeKalb, Ill. on Wednesday, June 27, 2012. Dr. Van asked Danika to get an MRI of the wrist and then come in for a follow-up. At the follow-up she was cleared to use her wrist for the International Kickboxing Federation's World Classic Amateur Kickboxing and Muay Thai Championships on July 20 to 22 in Orlando. Kyle Bursaw ‚Äì kbursaw@shawmedia.com Danika Thibault, 14, trains with a class at United Mixed Martial Arts & Fitness on Thursday, June 7, 2012. After winning the regional in Beloit, Wis. in May, Danika will travel to Orlando to compete in the International Kickboxing Federation's World Classic Amateur Kickboxing and Muay Thai Championships on July 20 to 22. Kyle Bursaw ‚Äì kbursaw@shawmedia.com Rena Thibault pins her daughter Danika's dress in their DeKalb living room while getting ready for an end of the year dance for eighth-graders at Clinton Rosette Middle School on Thursday, May 31, 2012. Kyle Bursaw –kbursaw@shawmedia.com Danika's father Sean tapes up her injured wrist prior to her first time sparring in over a month at the Academy of Human Performance in Aurora, Ill. on Tuesday, July 10, 2012. 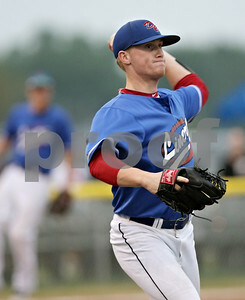 Kyle Bursaw ‚Äì kbursaw@shawmedia.com R.W. 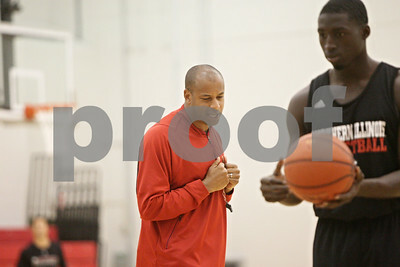 Brown, owner of the Academy of Human Performance, uses trigger point therapy to loosen up some of Danika's muscles at the beginning of a session in Aurora, Ill. on Tuesday, July 10, 2012. Kyle Bursaw ‚Äì kbursaw@shawmedia.com Danika practices some of her countering techniques against Nate Beach, 20, as Pat White, a boxing and Muay Thai coach (far left), and Sean Thibault (back left) look on at the Academy of Human Performance in Aurora, Ill. on Tuesday, July 10, 2012. 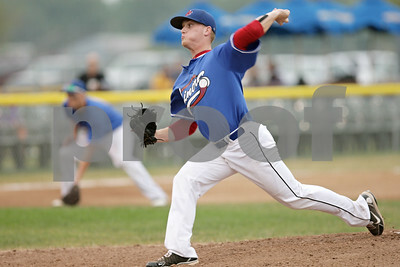 Rob Winner – rwinner@shawmedia.com DeKalb County Liners pitcher Brody Justice delivers a pitch in the top of the first inning during a game against the Chicago Zephyrs in Sycamore Thursday, July 19, 2012. 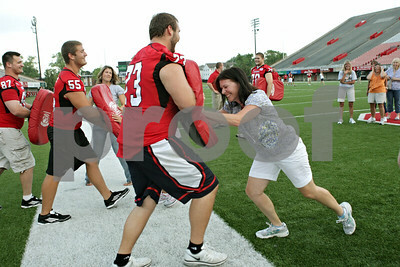 Rob Winner – rwinner@shawmedia.com Pam Nelson of Sycamore participates in a blocking drill with Northern Illinois offensive lineman Matt Killian during the Northern Illinois Football 101 Women's Clinic Wednesday evening. 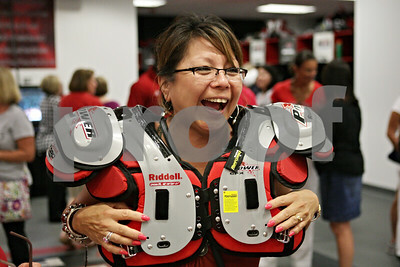 Rob Winner – rwinner@shawmedia.com Gwen Haigler of Sycamore tries on shoulder pads inside the Northern Illinois football team's locker room during the Football 101 Women's Clinic Wednesday evening. Rob Winner – rwinner@shawmedia.com After stepping on the second base bag to retire Chicago Zephyrs baserunner Ryan Adams (8), DeKalb County Liners shortstop Brent Turner (right) throws to first base for a double play to end the top of the first inning in Sycamore Thursday, July 19, 2012. 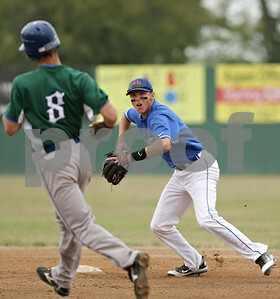 Rob Winner – rwinner@shawmedia.com After fielding a ground ball, DeKalb County pitcher Brody Justice throws to first base to retire Chicago's Drew Bailey (not pictured) in the top of the second inning during a game against the Chicago Zephyrs in Sycamore Thursday, July 19, 2012. 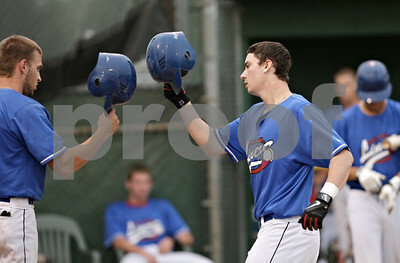 Rob Winner – rwinner@shawmedia.com DeKalb County's Joey Burney (left) greets teammate Cody Simon after Simon's two-run home run in the bottom of the first inning during a game against the Chicago Zephyrs in Sycamore Thursday, July 19, 2012. 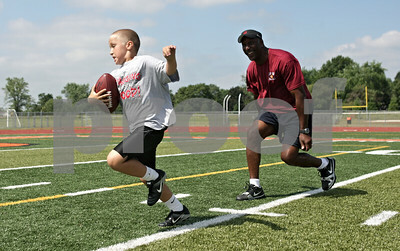 Rob Winner – rwinner@shawmedia.com After hauling in a pass from Steve Fuller (not pictured), Justin Hatton, 8 of DeKalb, makes a move on Otis Wilson before reaching the end zone during a football camp featuring former members of the 1985 Chicago Bears at DeKalb High School Friday morning. Tommy Padilla, 2 of Malta, stands on the bumper of a fire engine and smiles for his grandmother Anne Roussell (not pictured) before a dedication ceremony honoring Timothy Getzelman and Alexi Weber at the Sycamore Fire Department Fire Station No. 2 Sunday afternoon.